Power in the Canadian Open? 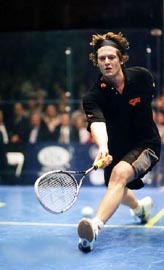 Former squash World No.1 Jonathon Power. It has now been confirmed that the rumours saying that Jonathon Power intends to take part in the Canadian Racketlon Open are not unfounded! Power announced his retirement from professional squash in March this year at a time when he, at the age of 31, was the oldest player ever to be number 1 on the squash world ranking. Last year he won five tournaments and climbed back to the number 1 spot for the first time in four years. That was another record; It was the longest gap between successive number one rankings since the squash world rankings were established in the early Eighties. When Racketlon.com met Power a few years ago he revealed that he actually, at a very young age, started his career as a badminton(!) player (which might well explain some of the very innovative techniques that he has brought into squash). He has also been seen playing a decent game of tennis and said that he would be very interested in trying Racketlon once his squash career slowed down. Power has recently moved from Montreal to Toronto and now lives cross the street from the "Badminton and Racquet Club of Toronto", the venue for the Canadian Open since the inaugural event in 2004. According to Canadian Open tournament director Stephane Cadieux, Power has now started to practice some badminton, possibly in preparation of the tournament to be held 9-11 March. "He is a quick learner" Cadieux reports. IF Power actually takes part he would be the first former World No.1 (in any of the four sports) to honour a Racketlon World Tour event following Sweden's Stefan Edberg's Racketlon debut in a small local tournament in his hometown Växjö back in 2004. Bad profile for Edberg?